Along the Geotrail Laas leading to the only petrified forest in Austria rocks, culture, wealth and catastrophes are story-telling elements of this small settlement. You can book this tour at the Visitor Center. 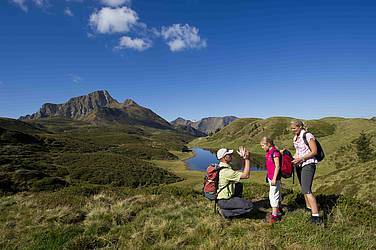 In the Garnitzen Gorge you will be guided by an experienced mountain guide. Along the trail the emerald green water passes differently coloured folded rocks, waterfalls and powerful limestone cliffs. The gorge provides an impression about the enormous forces which formed the landscape. Details and booking at: www.nassfeld.at. We encourage you to visit the fascinating landscape in the surroundings of Lake Wolayer with its rich fossil world of the tropics some 340 to 420 million years ago. You will discover marine fossils from a shallow sea and those who once lived in the deeper ocean. You can book this tour in the Visitor Center. In the gentle Alpine landscape around Lake Zollner you can experience a splendid outlook across the border to northern Italy in the south and the central Alps in the north. We will show you the best viewpoints and explain the variety of landforms seen in this part of the Carnic Alps. You can book this tour in the Visitor Center. In the hiking area around Naßfeld the deposits of a fossilized sea shore with rich occurrences of terrestrail plant and marine fossils are exposed. Your guide will show you the best fossil sites. Details and booking at: www.nassfeld.at. In the wild-romantic landscape in the surroundings of „Tuffbad“ near the village of St. Lorenzen with its unique occurrences of calcareous sinter you will experience the variety of rocks of the Gailtal Alps and the Lienz Dolomites. Details and booking: Jan Salcher; 0043 650 86 35 624.